Benue State Governor, Samuel Ortom has called on the Federal Ministry of Power, Works and Housing to prevail on the Federal Roads Maintenance Agency, FERMA to rehabilitate highways in the state. 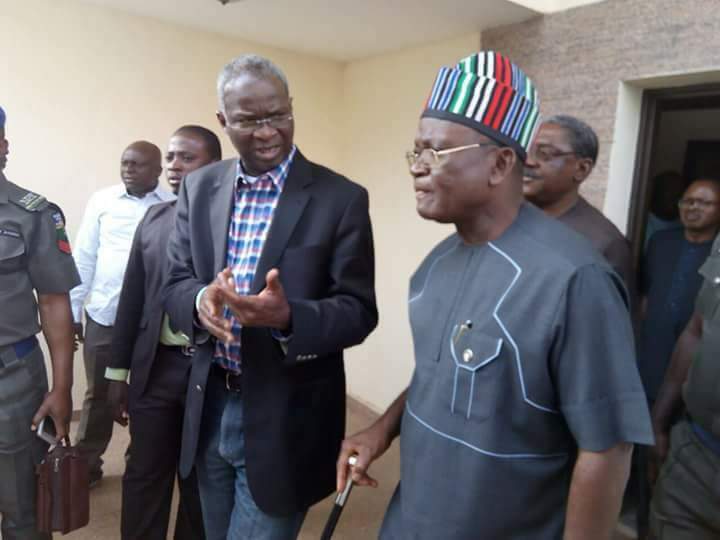 He made the call when he received the Minister of Power, Works and Housing, Mr Babatunde Fashola is in the state to inspect some federal government projects under his ministry. Governor Ortom sued for greater partnership with the Federal Government for the execution o critical infrastructure in the state. He promised to forward a comprehensive list of items for which his administration needs the intervention of the Federal Government. thanked the Minister for his visit. Earlier, Mr Babatunde Fashola told the Governor that he was in the state to assess the state of Federal Government facilities under his Ministry with a view to addressing the challenges. He said his ministry would collaborate with any relevant agency of the State Government to usher in the desired development.